A Bank is an organization, usually a corporation, charatered by a state or federal government, Which does most or all the following: receives demand deposits and time deposits, honors instuerments drawn on them, and pays interest on them; discounts notes, makes loans and invests in securites; collects checks, drafts, and notes; certifies depositor's check; and issues drafts and cashier's checks. The general superintendence and direction of the RBI is entrusted with the 21-members -strong Central board of Directors-hte Governors, four Deputy Governors, two Finance Ministry representatives, ten government-nominated Directors to represent important elements from India's economy, and four directors to represents local boards headquartered at Mumbai, Kolkata, Chennai and Nwe Delhi. Each of these local boards consists of five members who represent regional interests, as well as the interests of co-operative and indigenous banks. The Government of India appoints the directors for a four-year term. Its head office is in MUMBAI. 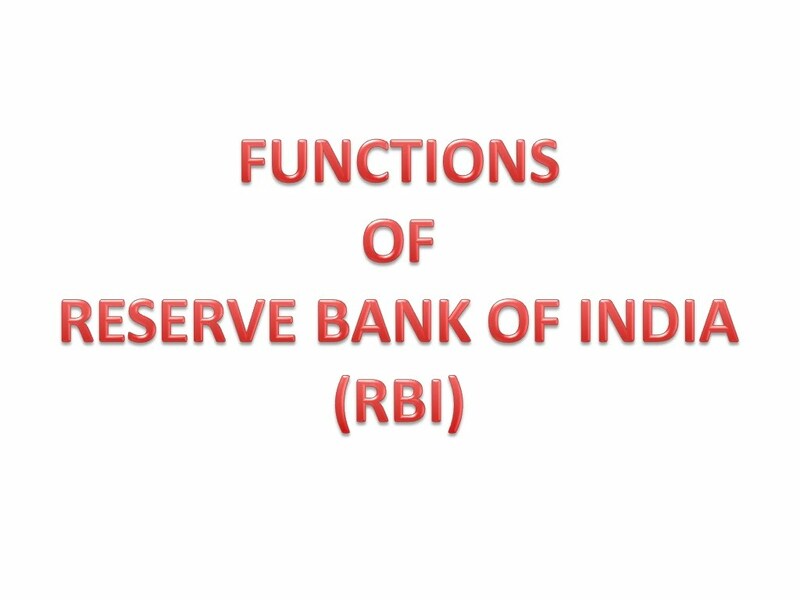 RBI is regulator and supervisor of the India financial system.It prescribes board parameters of banking operations within which the countary's banking and financial system functions. Its objective is to maintaine public confidence in the system, protect depositors' interest and provide cost-effective banking services to the public. RBI is also a member of the Asian Clearing Union . The RBI regulates the Indian banking and financial system by issuing broad guidelines and instructions. The objectives of these regulations include:. 1).Controlling money supply in the system. 2).Monitoring different key indicators like GDP and inflation. 3).Maintaining people's confidence in the banking and financial system. 4).Providing different tools for customers' help, such as acting as the "Banking Ombudsman". The RBI formulates monetary policy twice a year. It reviews the policy every quarter as well. The main objectives of monitoring monetary policy are:. Different Rates such as repo rate, reverse repo rate, and bank rate. Section 22 of the RBI Act gives authority to the RBI to issue currency notes. The RBI also takes action to control circulation of fake currency..
RBI is the Controller and Supervisor of Banking Systems. Prudential Norms: The RBI issues guidelines for credit control and management. The RBI is a member of the Banking Committee on Banking Supervision (BCBS). As such, they are responsible for implementation of international standards of capital adequacy norms and asset classification. Corporate Governance:The RBI has power to control the appointment of the chairman and directors of banks in India. The RBI has powers to appoint additional directors in banks as well. KYC Norms: To curb money laundering and prevent the use of the banking system for financial crimes, The RBI has â€œKnow Your Customerâ€œ guidelines. Every bank has to ensure KYC norms are applied before allowing someone to open an account. Transparency Norms: This means that every bank has to disclose their charges for providing services and customers have the right to know these charges. Risk Management: The RBI provides guidelines to banks for taking the steps that are necessary to mitigate risk. They do this through risk management in basel norms. Audit and Inspection: The procedure of audit and inspection is controlled by the RBI through off-site and on-site monitoring system. On-site inspection is done by the RBI on the basis of â€œCAMELSâ€. Capital adequacy; Asset quality; Management; Earning; Liquidity; System and control. Foreign Exchange Control:The RBI plays a crucial role in foreign exchange transactions. It does due diligence on every foreign transaction, including the inflow and outflow of foreign exchange. It takes steps to stop the fall in value of the Indian Rupee. The RBI also takes necessary steps to control the current account deficit. They also give support to promote export and the RBI provides a variety of options for NRIs. Development:Being the banker of the Government of India, the RBI is responsible for implementation of the governmentâ€™s policies related to agriculture and rural development. The RBI also ensures the flow of credit to other priority sectors as well. Section 54 of the RBI gives stress on giving specialized support for rural development. Priority sector lending is also in key focus area of the RBI. Apart from the above, the RBI publishes periodical review and data related to banking. The role and functions of the RBI cannot be described in a brief write up. The RBI plays a very important role in every aspect related to banking and finance. Finally the control of NBFCs and others in the financial world is also assigned with RBI. 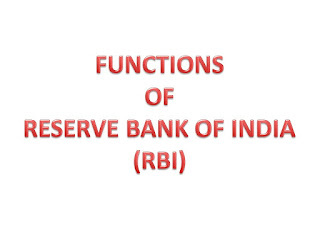 * To get the PDF file, download the Banking [RBI Functions] Structure Purpose Role Systems Control.